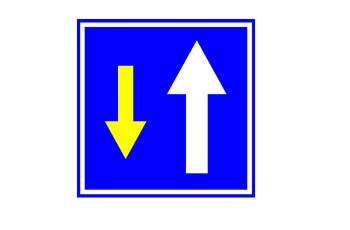 The notice above or below the road sign is only intended for vehicles turning in the direction of the arrow. Right turn is permitted for restricted vehicles only. Right turn is to a one-way street. What should you do when the traffic sign in the picture appears before you? Drive faster to prevent the car from shaking. Adjust your speed to the road’s conditions. Dont ignore an uneven road..
You are driving on a mountain road. Drive in low gear. Obey the instructions of Public Works Department employees. When the roadway is divided by a broken line? You are permitted to overtake restricted vehicles only. You are permitted to overtake when the road is clear. No overtaking until where the dotted line turns to an unbroken line. 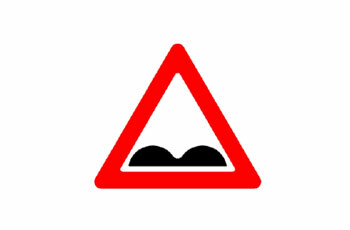 No overtaking until where an “end of overtaking restriction” sign is placed. Path for bicycles and motorcycles. 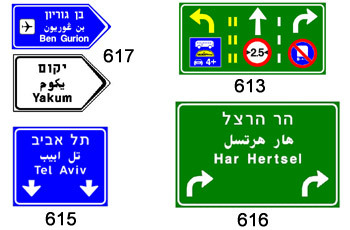 Is a bus used for driving instruction purposes permitted to enter where the following road sign is placed? No, except if it belongs to a bus company that won permission. Yes, except for vehicles with an all up weight that exceeds 10,000 kg. 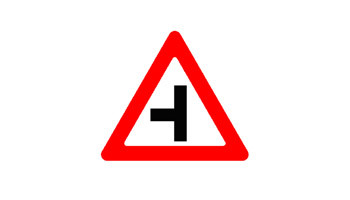 What is instructed by the following road sign? Give right-of-way. There is no need to stop. Slow down and give right-of-way. Stop for a moment, check the traffic and continue driving. Driving is permitted to the right only. No through road (cul-de-sac) on the right. 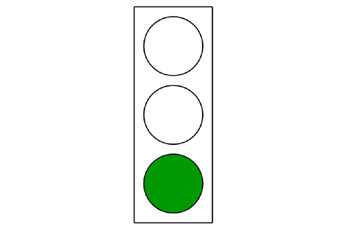 What is the meaning of the light appearing in the following traffic light? Stop – dont continue driving for as long as the red light is on. You may continue driving after verifying that the intersection is clear. Continue driving: Green light will appear shortly. Drive faster before the intersection with the traffic lights, in order to cross it before the light changes. Enter the roundabout carefully since you have right-of-way. Pay attention to traffic coming from your right within the roundabout. 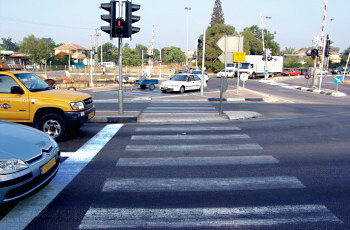 Stop before entering the roundabout and cross it quickly. 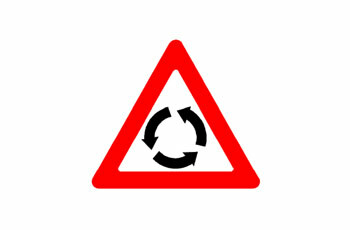 Slow down before the roundabout. Who is expected to approach from your opposite direction when the color of the arrow in the sign is yellow? Vehicles transporting more than 2 passengers. Public transportation vehicle or any other vehicle that is permitted according to the sign. 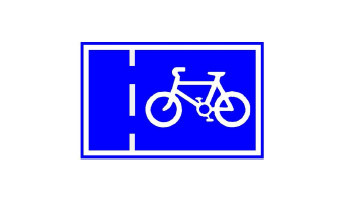 No overtaking or passing of a restricted vehicle only. No overtaking or passing of a motor vehicle with more than 2 wheels. 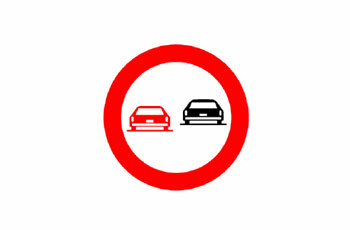 No overtaking or bypassing of a public vehicle only. No overtaking or passing of a non-motor vehicle with more than six wheels. 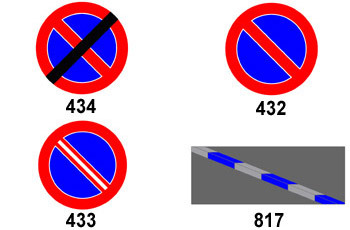 Which of the following traffic signs should be placed where parking and stopping at the side of the road are prohibited? You have right-of-way in the narrow road. 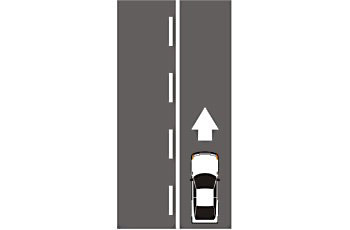 Give right-of-way on the narrow road to vehicles coming from the opposite side. No turning at the end of the road section. No through road (cul-de-sac) ahead. 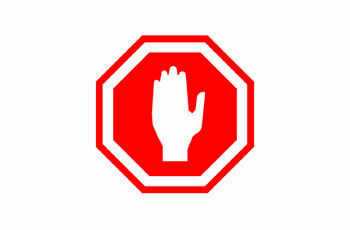 Who is obliged to obey the “stop” sign in the following picture? A driver wanting to make a left U-turn. A driver wanting to turn left only. A driver wanting to continue driving straight. Any driver approaching an intersection. 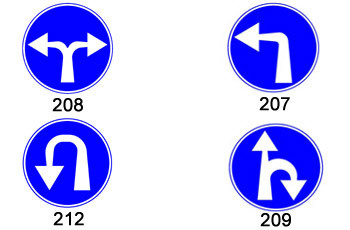 Which of the following road sign prohibits making a left U-turn? Passage for engine wheelchairs only. Parking for vehicles of handicapped people who have the sticker that is indicated in the sign. Stopping place for handicap vehicles only. Parking for all handicap vehicles. You are approaching a train station. 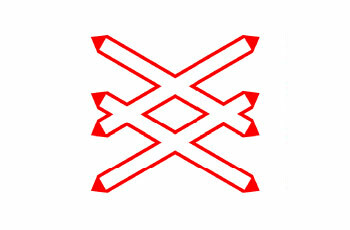 Level-crossing with train traffic in both directions. Level crossing, more than one track. 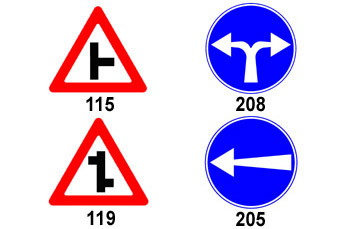 Which of the following traffic signs alerts about the approach to a T-junction to the right? What is the meaning of the following road marking? Parking line (parking space for vehicles or animals). Waiting line (in a place where there is no traffic sign). Stop line, a place for stopping a vehicle when it is necessary to do so..
What is signified when a traffic light displays red and yellow lights simultaneously? Prepare to drive when the green light appears. When turning right give right-of-way to pedestrians. The traffic light will shortly display red light only. Entrance to a one-way street. 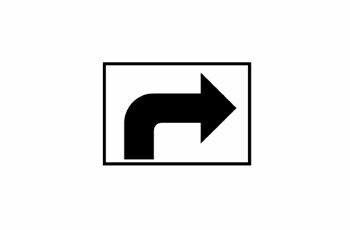 Follow the direction of the arrow. No entry for bicycles. Where would you stop when the traffic light in the intersection ahead displays a red light? Where are you required to stop when the following traffic sign is placed? At the center of the intersection, where the best field of view is located. If a stop line is marked – stop immediately after the line. Stop wherever you want before the intersection. If a stop line is marked – stop before and close to the line. 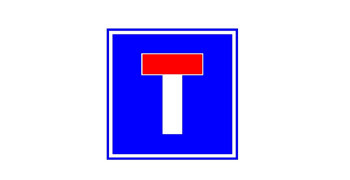 If a stop line is not marked – stop at the line of the junction. Until where does the following road sign remain valid? Until an “entrance to an urban road” road sign. Until 150 meters following the place of the sign. Until the nearest pedestrian crossing. 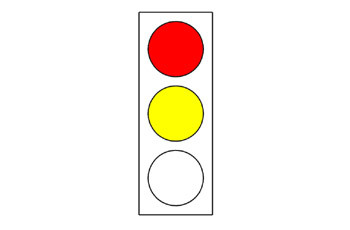 What is the meaning of the following traffic light (intermittently flashing red light)? Prepare to stop before the intersection with the traffic lights. It is a special traffic light before a level crossing. Stop before the crossing and don’t proceed for as long as the light is flashing. Stop before the intersection with the traffic lights. Drive faster before the crossing. 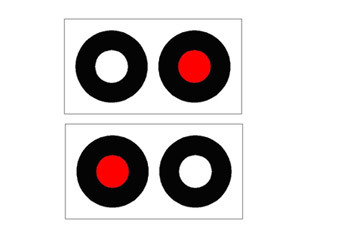 What is the marked vehicle required to do when the following marking appears on the road? The driver should not cross the separation line, but he is permitted to make a left U-turn. 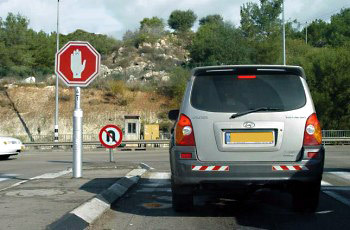 The driver of the marked vehicle should drive on the right of the lines, and he is prohibited from crossing the continuous separation line. The marked vehicle is permitted to cross the unbroken separation line. 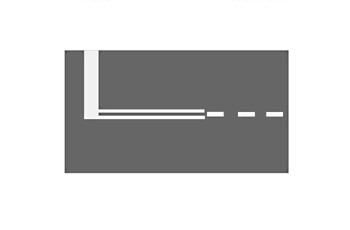 The marked vehicle should drive on the left side of the unbroken line. Continue driving only when the light starts blinking. Wait and don’t cross until yellow light appears. Start driving when yellow light appears. You may keep driving if the intersection is clear and safe. Taxi rank. No entry to the street in which the sign is placed. 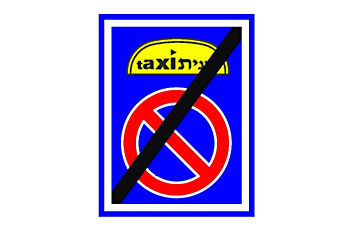 The end of the Taxi Rank. The beginning of a public bus station. Taxi rank. 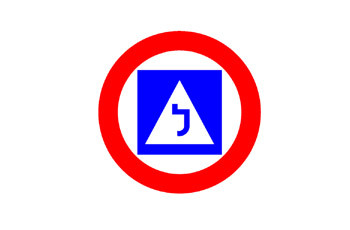 Parking and stopping is forbidden to all other vehicles.